These terms are drawn for a website that connects service providers with clients. It sets out the contract between your business and service sellers. You could operate openly as a market or you could ostensibly be a review site where you only promote particular services. You could charge the provider or your market place could be free to use and take advertising revenue. You may be a membership site where buyers subscribe. 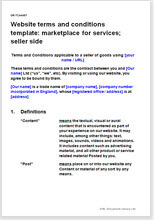 These T&C are suitable for a marketplace site that sells any type of service. Your site could connect providers of services such as gardening or personal fitness training with consumers, or services such as website design or consultancy with businesses. First it protects you in law from a huge array of potential problems arising from disputes between your provider and his client. So far as the Consumer Contracts (ICAC) Regulations are concerned, we have provided as far as possible for your providers to be responsible for compliance with the Regulations, so as to minimise the weight on you. If you sell only to business, you can easily remove the provisions relating to the Regulations. Secondly, it enables you to set out how your website works to benefit the provider. You will benefit from having standard terms for all providers so that a buyer can return to your site on multiple occasions and buy from a different provider without the terms being markedly different. It is possible that some of the providers who use your market place service also have their own contract with each client you introduce. You may need to provide for that in your website structure and your terms. If so, please contact us. Website T&C are probably the best example of a legal document where use of plain English strengthens the legal effect. It would be hard for a user of your site to claim that he did not understand, even if English is not his first language. This is one of the two T&C documents you'll need if you operate a website that provides a marketplace. Because each marketplace website has its own business model, we provide separate agreements for terms with buyers and providers. Provisions you will need for buyers vary more than those for service providers. So while this document covers many types of service, we offer several buyer side versions. The complementary template that provides terms for buyers can be found here. If buyers are required to subscribe (or become members) of your site before they can access the marketplace, then these T&C are more appropriate. The law relating to website T&C is largely common law that deals with the basics of contracts: offer, acceptance, price and payment, provision of service, liabilities and risk. By and large, you can set the terms you want. Additionally, there is a raft of consumer protection legislation with which these T&C also comply. We have provided very wide ranging protection of your website because we assume that your visitors will be able to interact on it. You can easily edit out what you don't need. This template includes provisions that cover both the relationship between the service provider and the buyer and the relationship with you. We also include over 2,600 words of notes to help you edit the document to suit the business model of your website precisely.